The Hungry Navigatrix | Seeker. Lover. Eater. In honour of my one year blogiversary, I thought I’d celebrate by sharing the best recipe I have come across for making a shortcrust pastry. Maggie Beer – come on down! Your sour cream pastry is an absolute winner. It gives you a delightfully light, crumbly, golden finish. I have made it over a dozen times now and it’s always impressive. Best of all it takes about 2 minutes to put together. That’s less time than waiting for a frozen pastry sheet to thaw! 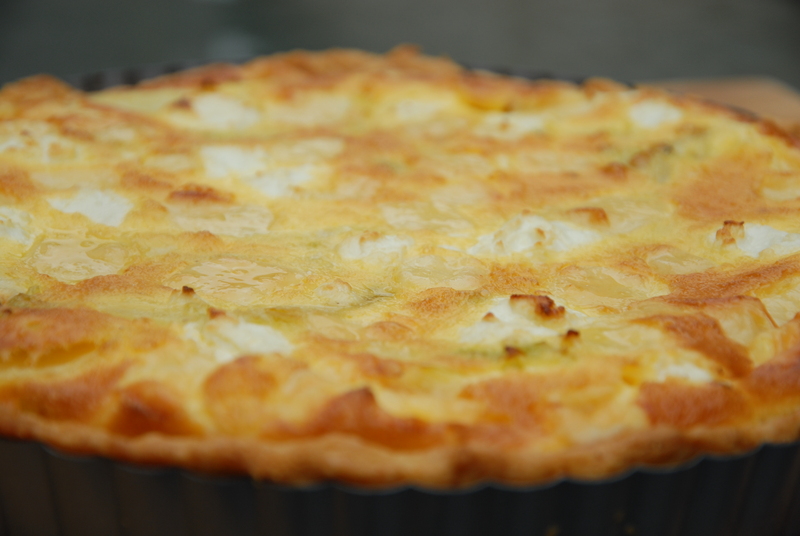 Today I’m using it to make a Cheese and Leek tart. I’ve used a combination of Gruyère and goat’s cheese but by all means experiment with your favourites. It makes a fantastic casual lunch. Just add a leafy green salad and you have a meal. So charge your glasses and let’s raise a toast to the wonderful Maggie Beer and to one year’s worth of my favourite recipes. I have loved sharing them with you. In a food processor, pulse the butter and flour until it resembles fine breadcrumbs. Add the sour cream and pulse again until the mixture magically rolls itself into a ball. Place a piece of cling wrap on the your benchtop and tip the ball of dough out onto it. Press it down lightly to flatten it out into a disc shape (no need to knead!) and wrap it up tight with the cling wrap. Rest in the fridge for about 20 minutes. Set your oven to 200 degrees C.
Roll out the pastry and line a flan or quiche tin. I find the pastry a bit sticky so tend to place my disc in the bottom and work it into the corners and up around the sides but you use the method you’re comfortable with. Line the pastry with baking paper, pour in rice or beans (or proper pastry weights if you have them) and blind bake the pastry for 15 minutes. Remove lining and weights and bake for a further 5 minutes. 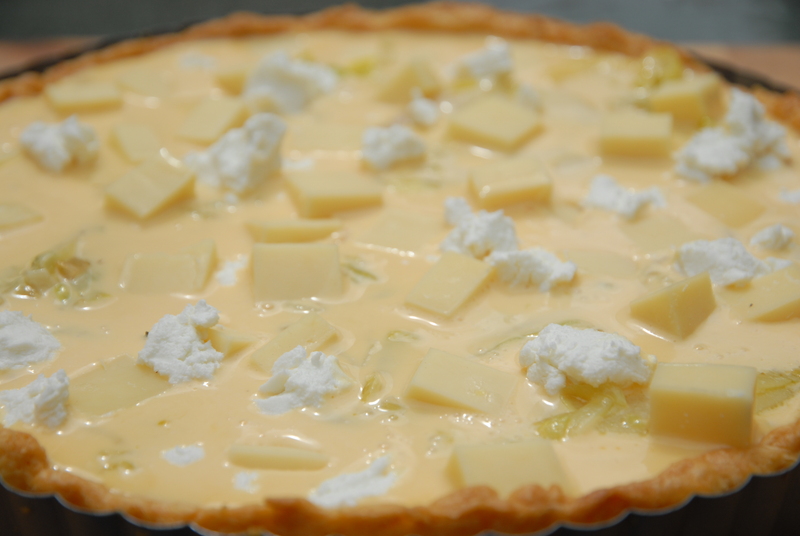 Cool your tart case slightly before adding your filling. Melt the butter in a frying pan and add the sliced leeks. Saute gently for a few minutes until soft, then add the potato slices, thyme and bay leaf. Gently move all this about the pan, making sure the potatoes are allowed to soften but the leeks don’t burn. When the potatoes are cooked, turn the off the heat and let the mixture cool slightly. In a bowl, whisk the eggs and cream. Season to taste. 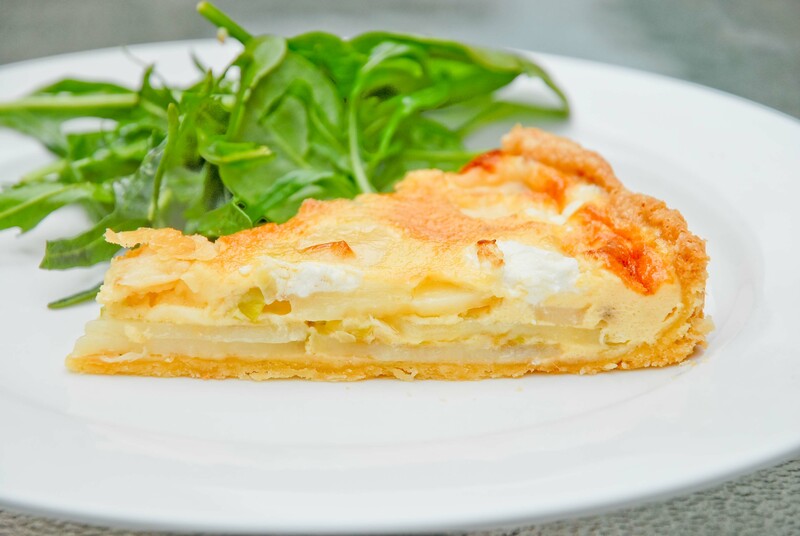 Arrange your leek and potato mixture over the bottom of a prepared tart case (see recipe above!). Remove the thyme sprig and bay leaf. Scatter and crumble your cheeses over the top. Bake for approximately 20 minutes or until the tart is golden and set. Enjoy with a leafy green salad and lovely glass of white wine.